Chronic Bronchitis is definitely a disease that all Respiratory Therapy students should be familiar with. That is because, once you start practicing as a licensed Respiratory Therapist, you will need to have a good understanding of the disease in order to treat your patients effectively. 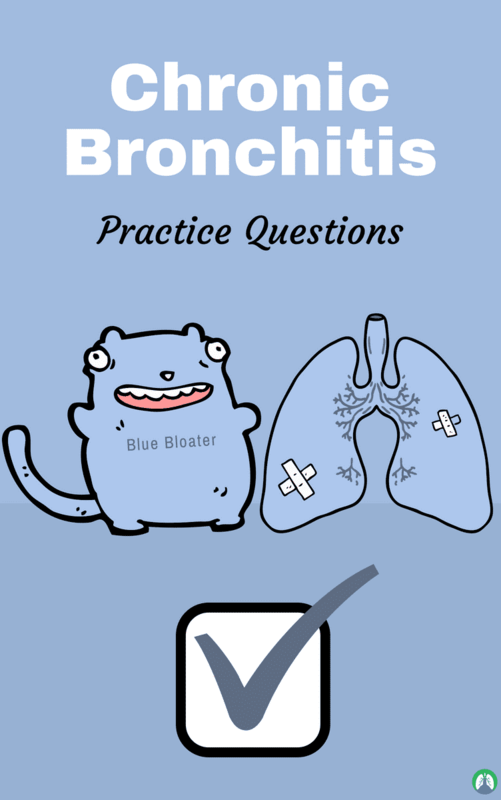 That is why we put together this study guide that is loaded with Chronic Bronchitis practice questions to help you learn all of the most important facts about the disease. So are you ready to get started? 1. What is the definition of chronic bronchitis? It is a chronically productive cough due to bronchial inflammation. In this condition, the bronchial mucus glands are enlarged. It is termed “chronic” when it lasts for at least three consecutive months of the year for two or more successive years. 2. What is the classification of chronic bronchitis? It is defined clinically rather than pathologically. It is termed chronic when it lasts for at least three consecutive months of the year for two or more successive years and is categorized as COPD (chronic obstructive pulmonary disease). Other potential causes of a chronic cough must be excluded. 3. What is the etiology of chronic bronchitis? Cigarette smoking is the number one cause. Pipe and cigar are contributing but in less degree. Severe and repeated childhood respiratory infections may increase susceptibility in later life. The disease is rare with non-smokers. 4. What is a nickname that we give to chronic bronchitis patients? 5. What are the ABG results for chronic bronchitis? Acute alveolar hyperventilation and hypoxemia. 6. Chronic bronchitis is a type of what? Chronic bronchitis is a type of COPD and is an obstructive disease. 7. What is the pathophysiology of chronic bronchitis? Increased mucus production, inflammation of small airways, loss of cilia and mucus plugging that causes airway obstruction that could lead to atelectasis. 8. What are the causes of pulmonary hypertension? 9. What are the causes of cor pulmonale? Right heart failure in later stages due to an increased workload on the right ventricle. It is caused by hypoxemia and constricts pulmonary vasculature leading to polycythemia with loss of mental acuity. Cor pulmonale is due to hypoxemia then it constricts pulmonary vasculature, a condition that affects the blood vessels along the route between the heart and lungs, which leads to polycythemia and eventually right heart failure. 10. What is the diagnosis of chronic bronchitis? Patients often deny symptoms because onset has been gradual and has become accustomed to symptoms. They do not consider symptoms seriously until exacerbation occurs as a result of acute infection. It is important to note smoking history in pack years. 11. What are the symptoms of chronic bronchitis? Increased cough, increased sputum production leading to mucoid (clear and thick), purulent (containing pus), hemoptysis (blood from rupture of superficial blood vessels), shortness of breath (dyspnea), mild at first but gradually increases over time, increases with exertion and eventually shortness of breath persists at rest. 12. What are the signs of chronic bronchitis? Accessory muscle use, breath sounds are prolonged expiratory phase with wheezing, rales and may clear with a cough. 13. What is the cause of cyanosis (more common than in emphysema) in chronic bronchitis? 14. What are the characteristics of a blue bloater? Stocky, overweight has a chronic productive cough, mildly distressed, cyanotic, swollen ankles and legs (pitting edema) distended neck veins as a result of cor pulmonale (right-sided heart failure), episodes of right side heart failure (blood vessels divert blood for less damage of the lung and oxygen is more available constricted vessels cause high blood pressure in the lungs), pulmonary hypertension, bluish color of the lips and skin, severe airway disease with less emphysema, relatively mild dyspnea, no weight loss, large heart, polycythemia, hypercapnia and hypoxemia (low oxygen in the blood). 15. What can be seen in radiographic findings? Hyperlucency (darkening, due to air trapping), flattened diaphragms, teardrop shaped heart and enlarged heart if right heart failure is present. 16. What can be observed on the pulmonary function test of patients with chronic bronchitis? Decrease in respiratory flows and vital capacity, expiration flows may improve post-bronchodilator if bronchospasm is present, diffusing capacity generally normal and as disease increases in severity, RV and FRC will increase. TLC and diffusing capacity are normal. 17. What are the laboratory findings of patients with chronic bronchitis? RBC increase in advanced disease and polycythemia. HCT and HB are increased in advanced disease and polycythemia. WBC is increased if infection present. ABG results will show normal in mild disease and hypoxemia as the disease progresses. Respiratory Acidosis with acute exacerbation shows ph decreased and Pco2 increased. Compensated respiratory acidosis develops as the disease progresses. 18. What are the available treatments for chronic bronchitis? Smoking cessation that may limit advance of symptoms and may allow some reversibility if only small airway damage has occurred, avoidance of other bronchial irritants, avoidance of infection by antibiotics to control acute exacerbations and bronchopulmonary hygiene therapy. 19. What comprises bronchopulmonary hygiene therapy? Chest physiotherapy, clearance devices, flutter valve, acapella and aerobics. 20. What is needed in aerosolized medication? Sympathomimetics (albuterol, xopenex), anticholinergics/parasympatholytics (Atrovent, Spiriva, Tudorza) and are used in combination with other bronchodilators. 21. What are the six ways to manage chronic bronchitis? Decrease/stop smoking, bronchodilator therapy, reduce exposure to irritants, adequate rest, proper hydration and physical reconditioning. 22. What is the prognosis of chronic bronchitis? It is variable. The patient may have a chronic productive cough for years without impairment of lung function and may progress quickly to disability. Some patients may have frequent infections with exacerbations and may progress to emphysema. 23. What are the chest findings of patients with chronic bronchitis? Decreased tactile and vocal fremitus, hyper-resonant percussion note, diminished breath sounds, crackles/rhonchi/wheezes and use of accessory muscles. 24. What are the x-ray findings of patients with chronic bronchitis? No abnormalities except the large bronchi. As peripheral bronchi are involved, significant ga trapping may occur. There is an enlarged heart if cor pulmonale is present and increased residual capacity. The diaphragm may be depressed or flattened, hyperlucency (darkening) due to air trapping and tear-shaped heart. 25. What are the major pathological changes associated with chronic bronchitis? Chronic inflammation and swelling of the wall of the peripheral airways, excessive mucous production and accumulation, partial or total mucus plugging of the airways, smooth bronchial airways (bronchospasm), and air trapping and hyperinflation of alveoli occasionally in late stages. 26. What are the clinical manifestations of chronic bronchitis? Persistent productive cough with purulent mucus and yellow/green mucus if superimposed respiratory infection. As the disease progresses, increased cough, increased congestion, and increased shortness of air. 27. What are the two major types of bronchitis? Simple (acute) bronchitis and chronic obstructive bronchitis. 28. What is simple (acute) bronchitis? It is usually caused by 80% virus or bacteria with no airflow obstruction. The presentation is usually mild and self-limited and requires only supportive care. The prognosis for this type is good. 29. What are the causes of chronic obstructive bronchitis? The major cause is cigarettes which is 90% percent of the cases, and airflow obstruction. 30. What is the prognosis for chronic obstructive bronchitis? Premature morbidity and mortality and may have an acute exacerbation of chronic bronchitis (AECB) also known as acute on chronic. 31. What is chronic bronchitis brought on by? Inspired irritants like cigarette smoke (for a prolonged period of time). 32. How do inspired irritants cause chronic bronchitis? It increases mucus production and size. The number of mucous-producing goblet cells in the airway epithelium increases as well. 33. What does chronic bronchitis do to the body? Thick, tenacious secretions (mucus) are produced that cannot be cleared. Damaged cilia where bronchial walls become inflamed and thickened edema. Accumulation of inflammatory cells and thickened smooth muscle becomes chronically hard and narrows airways (chronic branchospasm). 34. What parts of the lungs does chronic bronchitis affect? It initially only affects larger bronchi but eventually, all airways are involved. Obstruction of airway results, particularly during expiration when airways are narrowed. 35. What can chronic bronchitis cause over long periods of time? Right-sided heart failure (cor pulmonale). 36. What are the treatments for bronchitis? 37. Is chronic bronchitis irreversible? No. If patients stopped smoking, for example, the disease can be halted but not cured. 38. What is the difference between emphysema and chronic bronchitis? Emphysema is the destruction of the lung tissue while chronic bronchitis is when mucus is present in the airway of the lungs. 39. What can infections do on patients with chronic bronchitis? Bacterial and viral infections in the patient with chronic bronchitis generally exacerbate the condition. The bacterial infections cause purulent sputum because of the amounts of eosinophils and neutrophils. 40. What condition refers to a V/Q mismatch? 41. Why is pulmonary hypertension the second problem? Hypoxemia leads to polycythemia (elevated RBC’s). 42. What does acidosis do? It adds to the contraction of the smooth muscles in the pulmonary blood vessels. 43. When does cor pulmonale (right heart failure) happen? It occurs in the later stages due to an increased workload on the right ventricle. 44. What are the common symptoms seen on the physical exam? Increased cough and sputum production. 45. What is included in the sputum production of chronic bronchitis? It includes mucoid, may be purulent, and may have hemoptysis (cough out blood) due to rupture of blood vessels in the bronchi due to coughing. 46. How does shortness of breath present in chronic bronchitis patients? Mild at first then gradually increases over time. It increases with exertion and eventually, shortness of breath persists at rest. 47. What kind of breath sounds clears with a cough? Rhonchi because of the clearing of secretions. 48. What are the other common signs of chronic bronchitis? Other common signs are loss of mental acuity because of cor pulmonale and hypoxemia and cyanosis because of hypoxemia and polycythemia. 49. What are the medications for the treatment of chronic bronchitis? Sympathomimetics, albuterol and xopenex, anticholinergics/parasympatholytics, respimat and duoneb and xanthines. 50. When can oxygen therapy be used for chronic bronchitis? PO2 <55 mmHg on RmA and PO2 <60 on RmA when cor pulmonale or polycythemia is present. 51. Why is the prognosis considered variable for chronic bronchitis? It is considered variable as patients may have chronic productive cough for years without impairment lung function. It progress quickly to disability. Patients may have frequent infections or exacerbations and could progress to emphysema. 52. What are the four components in the treatment of chronic bronchitis? Assess and monitor disease which includes medical history, IS, ABG, progression, and exposure. Reduce risk factors include smoking cessation and avoid occupational pollution exposure. Manage and stable COPD with treatment plan such as bronchodilator (albuterol), B2-agionist, anticholinergics (Sprivia), theophylline (COPD, to extent), Long-acting bronchodilators (Serevent, Foradil), combinations (duoneb) and inhaled corticosteroids (Advair). Manage exacerbations through antibiotics, increase dose and frequency of medicines, bronchial hygiene therapy PRN, addition of systemic steroids (pregizone) and hospitalization. 53. What will patients with severe chronic bronchitis demonstrate? Peripheral edema, distended neck veins, elevated Hb concentration, and cyanosis. 54. What types of patients typically have chronic bronchitis? Patients who are overweight and between the ages of 30-40. 55. What are the four causes of chronic bronchitis? Cigarette smoking, repeated airway infections, genetic disposition and inhalation of physical or chemical irritants. 56. What are the four ways chronic bronchitis can develop? Chronic inflammation of bronchial mucosa resulting in scarring, hyperplasia of bronchial mucous gland/goblet cells, increased bronchial wall thickness and pulmonary hypertension. 57. What occurs when scaring from chronic inflammation and swelling of the bronchial mucosa causes chronic bronchitis? Elevated IL8 levels recruits neutrophil activation, elevated CD8 t-lymphocytes, extends into surrounding alveoli and prevents proper oxygenation and potentiate airway obstruction. 58. What occurs when hyperplasia of bronchial mucous gland causes chronic bronchitis? Increased mucus production and mucus combines with purulent exudate to form mucus plug. 59. What occurs when increased bronchial wall thickness causes chronic bronchitis? Resistance increases work of breathing, increased O2 demands and produce ventilation. 60. What occurs when pulmonary hypertension causes chronic bronchitis? Most serious outcome, excessive local hypoxia leads to vessel constriction, inflammation in bronchial walls with vasoconstriction of pulmonary blood vessels and pulmonary arteries and right-sided heart failure. 61. What are five clinical manifestations of chronic bronchitis? Shortness of breath, excessive sputum, chronic cough (more excessive in the mornings), evidence of excess body fluids and cyanosis (late sign – blue). 62. What are the four methods of diagnosing chronic bronchitis? Clinical manifestations, chest x-ray, pulmonary function test and ABG. 63. What are four factors to look for in the chest x-ray of achronic bronchitis patient? Increased bronchial vascular markings, congested lung field, enlarged horizontal cardiac silhouette and evidence of the previous infection. 64. What are three factors to look for in a pulmonary function test? Normal TLC, increased RV and decreased FEV1. 65. What are two factors to look for in an ABG? Elevated PaCO2 and decreased O2. 66. What are the seven types of medications that can be given for chronic bronchitis? Inhaled short acting B2 agonists, inhaled anticholinergic bronchodilators, cough suppressants, antimicrobial agents, inhaled/oral corticosteroids, theophylline products and low dose oxygen. 67. Why is low dose oxygen given to patients with chronic bronchitis opposed to giving a high dose of oxygen? High oxygen can cause a shutdown of the respiratory system and leads to free radicals. So there you have it! That wraps up our study guide with all the best chronic bronchitis practice questions that you will find on the web. I hope that you can use this information to prepare yourself to not only pass all of your classes in school, but to be the best Respiratory Therapist that you can be. Thank you so much for reading and I will see you in the next post, and as always, breathe easy, my friend!